I am happy to report that Blackie the cat is doing better. Why is a mystery, but, to some extent, we don’t question his renewed vigor, we just accept it for what it is. First off, Blackie is eating much better. He has gained a little weight, just how much we don’t know, but enough that he finally has a little heft to him again when we pick him up. We haven’t had to give him the infamous eating pills at all for a few weeks. Of course, it means I am constantly having to give him food, as he still doesn’t like dry food left out and wants the wet food flavors to be changed up on a regular basis, but, such is life. Last night and this morning he really showed he was feeling good. First, in the middle of the night, he burst through the cat door from the garage, ran from one side of the house to the other at breakneck speed, and let loose with a nice loud yowl. This morning, he was feeling a little more controlled and just bust through the cat door and ran the length of the hall. But still, two runs just a few hours apart. Now that is a cat who feels good! 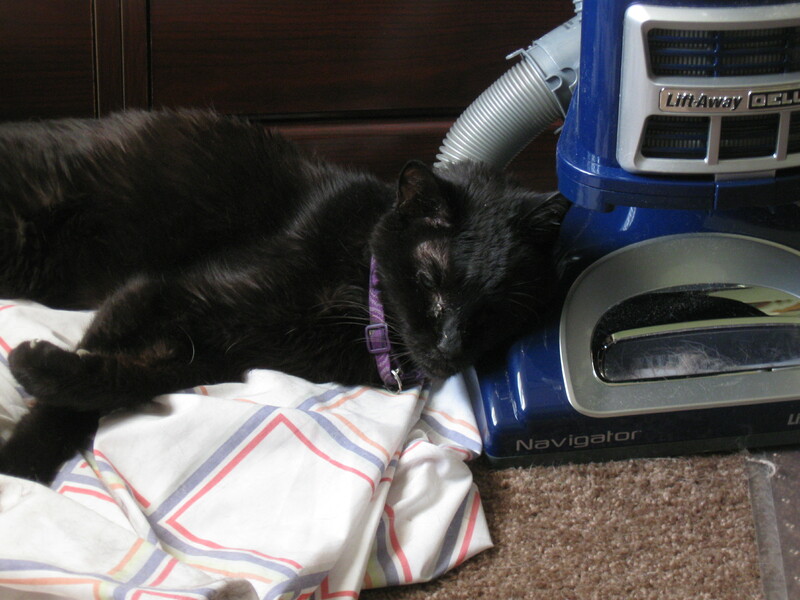 Another mystery – why is Blackie sleeping on the new vacuum cleaner? Glad to hear he is doing well. I don’t want to be pessimistic but there is this thing that a cat will exert a lot of energy just before passing. Hopefully he has found his inner kitten. We realize he is 17, so any renewed vigor can only be temporary. We are just here for the ride. Blackie is the captain of his own ship! I look forward to more Blackie stories and always pulling for him in his quest for renewed vigor. Lucky cat to have such loving pawrents! Maybe the vacuum is giving him his energy and that’s why he sleeps on it (LOL). Another mystery: How did Blackie get the same sheets my brothers and I had when we were kids? That is too funny! I got that particular sheet at a thrift store. We had someone stay over, the sheets got tossed int he corner when the blowup bed was taken out, and Blackie decided he liked laying on them. I didn’t want him laying on the regular sheets, so I went to the thrift store and bought a couple for a dollar each for him to lay on. You can’t see the other one in the photo.